On the top I the x-axis is the time, on the bottom the x-axis is “Innovation”. I won’t write more, because this picture is worth more than thousand words! Well, “Jungle out there” is not only a song by Randy Newman, it is a big problem of open-source office-suites. 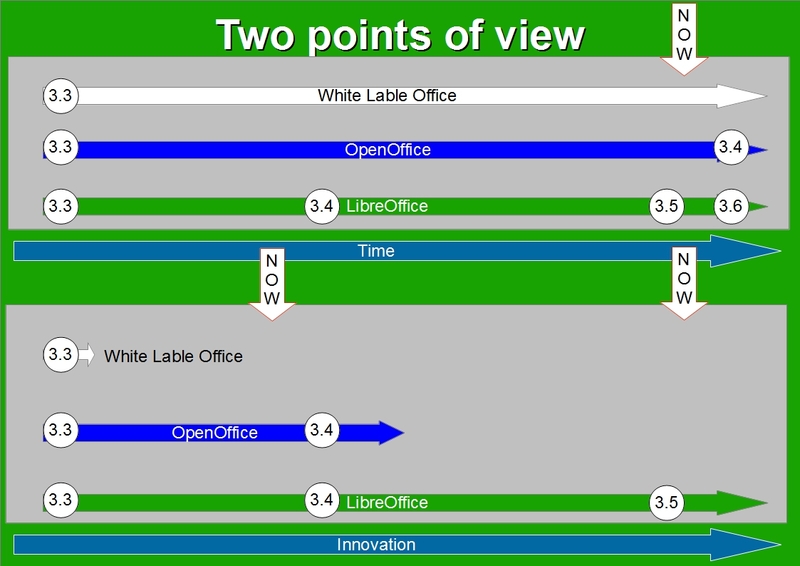 There is not only the traditional “OpenOffice”, there are also two forks: “LibreOffice” and “White Label Office”. I do now, that this was some time ago, but I do think, that it is very important. I prepared a chart about the way the three suites (or better the community beyond) behaves. Why are there that less releases? (my opinion…) Because the code has to be transformed, so that it is compatible to the Apache license This RC was just a protest against the slow release plan of Apache OpenOffice I can’t complain here…. You may have noticed why the jungle must be cleaned. For me, and this is just my opinion, there is not enough manpower to win against any other office suite or against the goliath “Microsoft Office”. All of us should take a deep whistle of the peace train and we should agree on a name, because basically we do want the same.